Căile Ferate Române (Romanian pronunciation: [kəˈile feˈrate roˈmɨne]; abbreviated as the CFR) is the state railway carrier of Romania. As of 2014, the railway network of Romania consists of 10,777 km (6,697 mi), of which 4,029 km (2,504 mi) (37.4%) are electrified. The total track length is 22,247 km (13,824 mi), of which 8,585 km (5,334 mi) (38.5%) are electrified. The CIA World Factbook lists Romania with the 22nd largest railway network in the world. The network is significantly interconnected with other European railway networks, providing pan-European passenger and freight services. CFR as an entity has been operating since 1880, even though the first railway on current Romanian territory was opened in 1854. Societatea Feroviară de Turism, or SFT, which manages scenic and tourist railways. CFR is headquartered in Bucharest and has regional divisions centered in Bucharest, Cluj-Napoca, Iași and Timișoara. Its International Union of Railways code is 53-CFR. The first railway line on Romania's present-day territory was opened on 20 August 1854 and ran between Oravița in Banat and Baziaș, a port on the Danube. The line, which had a length of 62.5 km, was used solely for the transportation of coal. From 12 January 1855, the line was operated by Imperial Royal Privileged Austrian State Railway Company, the Banat province being at that time part of the Austrian Empire. After several improvements in the following months, the line was opened to passenger traffic from 1 November 1856. Between 1864 and 1880, several railways were constructed in the area of the Kingdom of Romania. On 1 September 1865, the English company John Trevor-Barkley began construction on the Bucharest–Giurgiu line. Commissioned by the King of Romania, the line was opened to traffic on 26 August 1869. The Bucharest-Giurgiu line was the first railway built on Romanian territory at that time (considering that the Oraviţa-Baziaş line was part of Austria-Hungary, even though it now lies on Romanian territory). On 10 September 1868, Bucharest's Gara de Nord (North Station) was finalised. 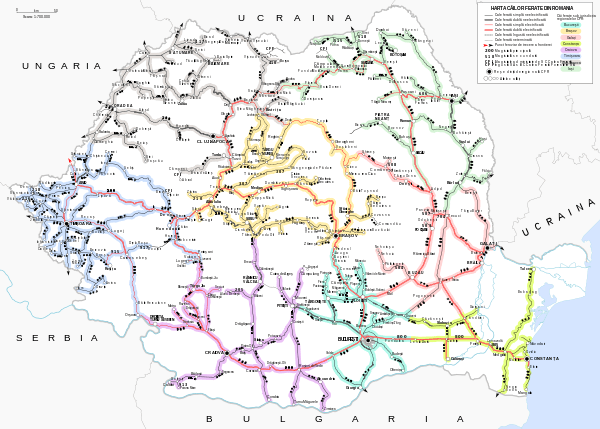 In January 1880, the Romanian Parliament voted to transfer the ownership of the Vârciorova-Roman line from the private administration of the Strousberg consortium to state ownership, under the administration of CFR. 1880 therefore marks the start of the Căile Ferate Române institution which survives to this date. The first administration of CFR was made up of Ioan Kalinderu, Eugeniu Stătescu and Ștefan Fălcoianu. In May 1868, the Romanian state concluded an agreement with another German consortium, known as the "Offenheim Consortium", for the construction of several shorter railways in the region of Moldavia. The lines, which had a total length of 224 km, would run from Roman to Ițcani, from Pașcani to Iași and from Verești to Botoșani. 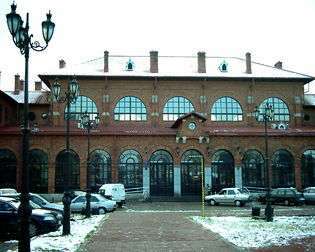 In 1870, the Iași railway station was inaugurated and the lines were progressively opened from December 1869 to November 1871. Due to the poor management of the lines by the Offenheim Consortium, they were placed under the management of CFR in January 1889. Meanwhile, during the Romanian War of Independence in 1877, Romania annexed the region of Dobrogea, which had previously belonged to the Ottoman Empire. The Romanian state placed under the management of CFR the Constanța–Cernavodă line, which had been opened during the Ottoman times in 1860. The Bucharest-Giurgiu line, the first line constructed in the Kingdom of Romania, was also placed under the administration of CFR during this time. Hence, by 1889, the Romanian state became the owner of all of the lines in the Kingdom of Romania, the railway system having a total length of 1,377 km. CFR steam engine 230-039 exhibited in Sinaia railway station. The 230 series were steam engines used for passenger train service. In 1918, the historical regions of Transylvania, Banat, Bassarabia and Bucovina united with the Kingdom of Romania to form Greater Romania. As a result, all railway lines in these regions, previously under the ownership of Austria-Hungary or the Russian Empire, were placed under the administration of CFR. This event was significant for Romanian railways because it meant that the large Arad rolling stock and steel factory, previously located on Austro-Hungarian territory, was now part of Romania, and was consequently used to produce a wide range of rolling stock and locomotives for CFR. 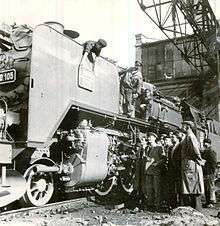 The 1000th locomotive built in Resita, 1955. After the Romanian Revolution of 1989, which resulted in the fall of Communism, Romania was left with one of the largest, most dense and most frequently used railway networks in Europe; but at the same time having relatively outdated infrastructure. This, combined with the economic decline that Romania faced in the 1990s due to its transition to a market economy, resulted in CFR entering a period of relative decline. Several little-used routes, especially in rural areas, were cut back, and rolling stock, most of which was acquired in the 1970s, entered a period of disrepair. CFR's image, both domestically and abroad, suffered greatly, due to reports of dilapidated trains, poor service and general disarray of management. This situation continued until the year 1998, when Societatea Naţională a Căilor Ferate Române (The National Society of Romanian Railways) was split into five independently administered companies : Compania Națională de Căi Ferate "CFR" SA (National Railway Company "CFR" – dealing with infrastructure), CFR Călători (CFR Passenger Services – the operator of passenger trains), CFR Marfă (Freight transport company), CFR Gevaro (Services linked with restaurant cars) and SAAF (dealing with excess rolling stock to be sold, leased or scrapped). After this, the situation of Romanian railways improved significantly, mainly spurred on by Romania's economic boom after the year 2000, which permitted a considerable amount of government investment in railways and has led CFR to once again become one of the most successful railway operators in the region. Some other line closures were thought imminent especially on the branch lines in Timiș county, which were generally very old, little-used and heavily damaged by the 2005 floods in that area; but most seem to have been reprieved and now are operated by private operators. 1000–1500 km of railway lines have been divested of CFR control and a few have closed completely since 1990, most of which were in rural areas. Overall however, actual railway closures in Romania have been much less drastic than in other former Communist block countries (such as Hungary and Eastern Germany); indeed the "closure" figures given include lines which have been taken over by private operators and continue to operate (2010). Some standard gauge lines have in fact reopened since closure in the 1990s and some narrow-gauge tracks have recently been reopened by SFT (CFR's Railway Tourism Society) for tourism, but are only run occasionally, about twice a month (lines include Abrud-Câmpeni, Târgu Mureș-Band or Moldovița-Vama). All forestry railroads (căi ferate forestiere in Romanian) still in operation after 1989 have been privatized and sold to the forestry companies. Some, such as the Vasser Valley Scenic Railroad, have since become significant tourist attractions. In the year 2000 some 47,560 people were employed by CFR. By July 2010 this had reduced to 25,382(see report below)in part due to the divesting of certain operations to other (private) companies. Other economies continue and are envisaged and are set out in the report Strategia de restructurare a domeniului feroviar August 2010 published by the Romanian ministry of transport (August 2010). In the early 2000s, CFR embarked on a comprehensive modernization programme in order to improve its image, which was, both internationally and domestically, plagued by reports of poor service and outdated rolling stock. The first phases of the modernization included a refurbishment of a large number of Rapid and InterCity rolling stock, as well as a general expansion of IC services to form a Romania-wide express network. To strengthen the growth of the Romanian InterCity network, CFR acquired in early 2003 several new Siemens Desiro trainsets, some of which were assembled in Arad, Romania. Nicknamed "Săgeata Albastră" (Blue Arrow), they are used on Accelerat, Rapid and InterCity services for short and medium distances. The Desiro trainsets were used as the icons of CFR's modernisation, despite criticism that CFR shouldn't have used the Desiro trainsets, which are diesel multiple units, on mainline express services, as they are designed mainly for short-distance commuter rail, as seen by their fairly hard seating, low speed, and poor noise insulation. CFR responded to this by introducing, in late 2004, a number of new Desiro trainsets that had better sound insulation and 70 seats, instead of 110 seats, thereby increasing the width and pitch of the seats. To this date, CFR continues to use Desiro trains on medium-distance routes, even though it has replaced them on several long-distance routes by other refurbished rolling stock. Aside from the Desiro, CFR has also bought in the past few years 80 new sleeping cars (WLABmee type), couchettes, InterCity cars, as well as double-decker cars to use on Accelerat and Rapid trains of a high volume of passengers. The new CFR sleepers are some of the most modern in Europe, having air-conditioning, LCD screens and modern showers in each compartment. Apart from improvements in rolling stock, CFR has also bought or modernised several locomotive classes, including the widespread Class 40 and Class 41 electric locomotives. Part of the CFR modernisation programme is the XSELL system, which seeks to establish a Romania-wide electronic ticketing system. The XSELL system was launched at Bucharest North station (Gara de Nord) in November 2004, and is now in use in almost all major railway stations in Romania. In 2003, Romanian mobile phone operator Connex GSM Romania, now Vodafone, struck a deal with CFR to provide quick mobile services to the CFR timetable and booking system. A 24-hour hotline operates where customers of Connex can call a certain three-digit number (652) and get real-time information on train routes, timetables, station platform departures, delays, prices and ticketing information and booking of trains from Bucharest North station. Orange Romania has signed a similar agreement in early 2004. 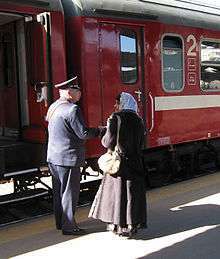 Smoking is banned on all CFR trains as of 1 September 2006. CFR services continue to improve, with the company reaching a turning point in its business strategy and services being some of the best in the region. However, some people have raised concerns that CFR, which has not reached profitability yet, does not have the means to finance ongoing infrastructural modernization, especially in the context of a government that is, at present, keener to develop road infrastructure at the expense of railways. CFR initiated a major infrastructure project in April 2006 – the modernization of the Bucharest – Constanța railway line, in order to improve the maximum speed attainable on the line (from 140 km/h now to 200 km/h in 2008) and increase the capacity of the line. Completion date is estimated to be mid-2008. Although passenger railway services are not a state monopoly in Romania, CFR remains the only passenger carrier operating at a national level. However, after the reorganization of CFR in 2011, around 15% of Romanian railway tracks have been leased to private companies. These are known as non-interoperable tracks (linii neinteroperabile in Romanian). The main operators are: S.C. Regional S.R.L., S.C. Transferoviar Grup S.A., S.C. Regiotrans S.R.L., and S.C. Servtransinvest S.A. which now operate a significant number (especially Regiotrans) of routes <http://tren.transira.ro/>. Early transfers to these companies included Zărnești–Brașov, Brașov–Întorsura Buzăului, Sfântu Gheorghe–Brețcu, Sighișoara–Odorheiu Secuiesc, Șibot–Cugir, Blaj–Praid, Galaţi–Bârlad, Buzău–Nehoiaşu, Iaşi–Dorohoi, Timişoara Nord–Nerău, Satu Mare–Bixad, Arad–Nădlac, Bistriţa Bârgăului-Bistriţa Nord–Luduş, Arad–Brad, Roșiori Nord–Piatra Olt and many others lines. On these lines, CFR is not allowed to operate its trains—companies which have leased the tracks have a virtual monopoly on their usage. Aside from CFR Călători, 12 other companies provide local passenger services, on non-interoperable tracks, even though none of these services exceed 40 km in line length. 28 private companies, including Petromidia and Servtrans, operate freight transport services on main lines with their own rolling stock, leasing usage rights from CFR. As of March 2013, the Ministry of Transport is planning to privatise CFR Marfa, the freight division of CFR. September 2014 saw the publication of the government report: Master Plan General de Transport al României. On the face of it the lengthy report envisages reduction of passenger services on 25% to 40% of the lines. The 'small print' reveals however that closures will not happen overnight or even over the next few years (there is no closure schedule in the report); and closures will only occur if private operators or local authority/perhaps EU financial support cannot be obtained. In addition the report has costed major improvements to the long-distance network considerably to reduce journey times. These projects include recommencing work on the abandoned construction(90% completed in the 1990s) of the 39 km link line from Râmnicu Vâlcea to Valcele which will reduce the journey from the Capital to Sibiu by some 78 km and journey times by at least 90 minutes. CFR Călători, the passenger service division of CFR, operates seven types of passenger train, both on Romania's territory, with rolling stock and locomotives, or internationally, with rolling stock. Also, CFR operates international trains on Romanian territory with its own locomotives. The train types vary in terms of speed and type of rolling stock. In 2015, approximately 55 million passenger journeys were made with the company. In the same time 12 million further journeys were made using the private operators. Aside from the seven main train types, CFR also operates night trains, which can be of any status (usually Rapid, InterCity or EuroNight). Freight trains, operated by CFR Marfă, have a different numbering system. 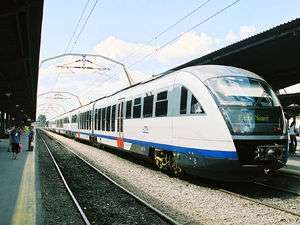 Regio trains (regional), formerly Personal trains (until December 2011), also known as commuter trains (navete or trenuri de navetiști), are the most abundant type of trains on the CFR passenger network. They are used for two main purposes, as shuttle, or commuter, trains, linking towns with neighbouring villages, and linking neighbouring cities with each other. Personal trains (now Regio), have the lowest average speed (34.3 km/h in 2004) and the least comfortable (usually oldest) rolling stock, and have a reputation for being very slow, crowded and generally unkempt which is only gradually changing. Regio trains operate mostly on local routes and stop at every station. Train fares for this type are the cheapest, since no supplement is paid, only the base fee, based on distance. Seats are not reservable. The rolling stock on Regio trains differs widely. On routes that link neighbouring cities with each other (such as Bucharest and Pitești), the quality of the rolling stock is much better than those services which provide a shuttle link between cities and rural areas (such as the Timișoara-Berzovia line). Most Regio rolling stock consist of uncompartmented single and double-decker cars. Some train services of this type, especially on rural routes, only have 2nd class rolling stock (i.e., there are no 1st class carriages). As of 2007, most Regio trains have only 2nd class cars. The livery of most Regio cars is painted in blue, with the rolling stock built in the 1970s and 1980s. Some very short rural routes in Romania's Bukovina region use rolling stock from the 1940s and 1950s, refitted with bus seats and operating like railbuses. CFR is refurbishing a range of double-decker Personal cars, that will be used on Personal and Accelerat trains. The refurbished cars, painted in exactly the same livery as the old ones, have been introduced since 2003, and are cleaner, although they still use most of the old fittings. Some routes (like Sibiu–Craiova) are operated by Desiro trainsets whereas others are operated by modernized electric trainsets. The new private operators also use the term regio using mainly (refurbished) railbuses. InterRegional trains (IR), formerly Accelerat and Rapid trains (until December 2011), are used for medium and long-distance services that stop only in towns or cities. InterRegional trains have higher speeds. They are also more expensive, requiring the payment of a supplement alongside the base fee. Some services of the InterRegional type require a reservation. InterRegional trains are also used for cross-regional long-distance routes (for example, Timișoara to București). 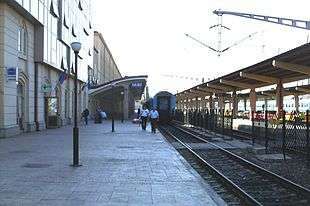 Despite the long distances, InterRegional trains tend to stop in every town (even though they bypass villages) and hence are very popular, though they are seldom used for express travel between two large cities. Since 2009, the InterRegio 1821/1822 from Arad to Constanța via Deva, Tîrgu Jiu, Craiova and Bucharest also travels to Constanța with an extra sleeperette car and sleeper car. The InterRegio rolling stock is formed of both single-decker cars, either of the old Y type, painted in blue, plain or with a white horizontal stripe or of the new "red" series and of new double-decker cars. 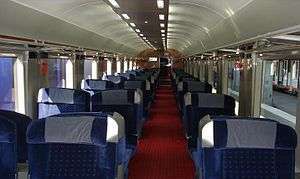 Single-decker cars are all corridor-type, with the old cars having 8 seats per compartment in second class and 6 in first class whereas the new cars have 6 seats per compartment regardless of class. Double-decker cars have 4 seats per row in an open plan. Accelerat trains also have a reputation for being overcrowded and dirty due to the long distances which they travel and the relatively frequent stops they make. In early 2005, it introduced a new double-decker car for medium-distance, highly used InterRegional (former accelerat) routes such as Bucharest–Predeal. Desiro trainsets have also been introduced on medium-distance InterRegional routes in Transylvania and Moldavia (Iași – Vatra Dornei). Longer-distance InterRegional trains often have couchettes, and sleepers started to be added again to consists after a lengthy absence. Dining cars are never used on these trains. In the 2010 schedule, many short and medium distance routes (such as Bucharest–Craiova, Bucharest–Râmnicu Vâlcea–Sibiu, Bucharest–Tulcea, Craiova–Sibiu, Timișoara–Sibiu, Cluj-Napoca–Timişoara) were served by modernized double-decker cars or Desiro trainsets. Some long-distance trains (Bucharest–Timișoara, Bucharest–Târgu Jiu–Arad, Bucharest–Cluj-Napoca–Satu Mare, Bucharest–Iași, Bucharest–Vatra Dornei, Iași–Timișoara, Sighetu Marmației – Bucharest) also use modernized Rapid-style cars. Rolling stock on InterRegional trains has recently been the object of CFR's modernisation plan. Various classes of cars have been refurbished, and fitted with air-conditioning, ecological toilets, etc. However, a small and rapidly declining number of Rapid rolling stock, mainly on lesser-used routes, remains fairly aged and outdated. 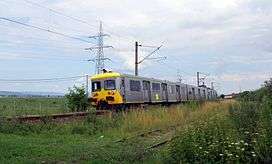 As of 2004, Siemens Desiro DMUs have been introduced on medium-distance Rapid routes. Most Rapid rolling stock is painted in red, usually with a white horizontal stripe. All cars are compartmented and first class is usually air-conditioned, with 6 seats per compartment both in second class and first class. Sleepers, couchettes and dining-cars are available on most long routes. From Sighetu Marmatiei the Rapid train needs over 21 hours to complete the 850 km trip, from Satu Mare nearly 22 hours to complete the 928 km trip. from Oradea over 19 hours to complete the 913 km trip, from Timişoara Nord over 15 hours to complete the 795 km trip. In the case of travelling such a long distance as mentioned above, it is recommended to book a sleeperette (you can choose between 4–6 passengers in a compartment). The 6 passenger-compartment is the cheapest option for a higher comfort. Fares and timetables can be checked on www.infofer.ro (click the English flag). InterCity (IC) is CFR's premier train type and is used for daytime express services between major cities, as well as shuttle services between Bucharest and the Black Sea coast and the Carpathian mountain resorts of Sinaia and Predeal. InterCity trains typically only stop in large cities (generally of over 100,000 inhabitants). InterCity trains are the fastest out of all the train types, having an average speed of 87 km/h in 2004, and also use the most modern and comfortable rolling stock, rivalling the premier services of other European carriers. Due to this, InterCity prices include a significant supplement alongside the base fee. However, due to the fact that IC services are only slightly more expensive than Rapid services, InterCity trains have become very popular for both travellers and businesspeople. There are two main types of InterCity rolling stock: standard (or "classic") and Desiro. The standard InterCity rolling stock is either new or refurbished (all IC rolling stock was built after 1995), with air-conditioning, power-plugs (in both 1st and 2nd class carriages) and plush bucket armchairs, as well as complimentary newspapers, free meals and airplane-like service in first class. These trains generally have a reputation for their high levels of comfort, cleanliness and service. The InterCity standard livery is usually grey and red, especially in the case of the C160-class rolling stock, which is the newest type. Most InterCity rolling stock is compartmented, even though recently there has been a trend to abolish compartments in the process of refurbishing cars. 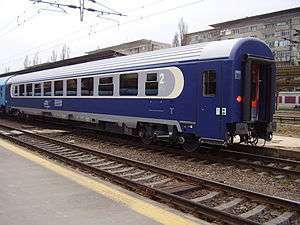 High-passenger and international IC services, such as the Bucharest-Constanța route, use the Romanian-built Astra AVA-200 cars, which have a maximum speed of 200 km/h and are the most comfortable rolling stock in the CFR fleet. 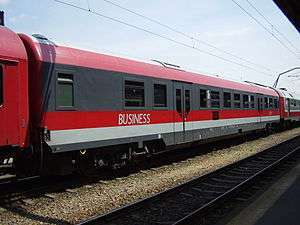 In fact, according to Friends of CFR, a Romanian railway journal, there was a considerable downgrading in quality when the Bucharest–Vienna IC service switched from being operated by CFR to being run by Austrian Railways (ÖBB) in 2003, leading to numerous complaints that the route should revert to CFR cars instead of Austrian ÖBB cars. Beginning with December 2006, the company introduced the business service on certain IC routes (București Nord – Timișoara Nord, București Nord – Oradea). These wagons were refurbished by CFR Griviţa and they provide two classes: standard and standard exclusive. According to class, these rail cars provide leather or fabric-covered armchairs, monitors, individual displays for every seat, 4 channel audio system with earphones, wireless internet access, bar, air conditioning, and they are equipped with an elevator for disabled travellers. 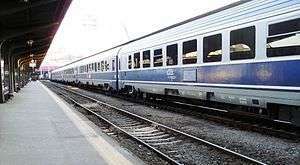 Before early 2003, there was also a train type known as InterCityExpress (ICE), which ran from Bucharest to Constanța, but these have been discontinued and transformed into IC, while maintaining the same rolling stock. Because of the Bad infrastructure as of 2015 InterCity trains are not in use anymore because the fare was to high. There are some trains which are running like InterCity but with InterRegio cost. EuroCity (EC) and EuroNight (EN) are international trains which are usually run by CFR in partnership with another national carrier, depending on the origin and destination of the route. There trains are part of the pan-European express railway network. Not all international trains that come to or via Romania are of EC or EN type— most are usually run as Rapid trains on the territory of Romania. However, the night train from Belgrade to Bucharest is run as a EuroNight train, and there is both a EuroCity and a EuroNight train from Budapest to Bucharest via Arad. EuroCity trains are almost always comfortable and modern, even though not perhaps as comfortable as InterCity, since they generally use the same rolling stock as Rapid trains. EuroNight trains use modern sleepers and have a generally good safety record. The CFR operates several different types of sleeping cars in EuroNight and other night trains. In international trains, the sleeping cars built by Deutsche Waggonbau AG around 1990 are preferred as these have a good level of comfort and showers. They are undergoing serious refurbishment to comply with international standards. In addition, several older types of sleeping cars (WLAB33, T2S) were recently bought second hand from Germany; these are being modernized and mostly used inside Romania and to the neighbour countries (as shown in the picture). They have replaced the archaic OSShD-B/Y sleeping cars previously used in these services. On 11 December 2011 a new timetable was to come into force to be valid until 8 December 2012. However, the current ranks of passenger trains were to change in three new categories, informs a press release from the Ministry of Transport (MT) in Romania. Depending on services, ranks of passenger trains were to be divided into three new categories: Intercity (IC), InterRegional (IR) and Regional (R). In the new 2011–2012 plan international trains will run 70, 40 InterRegional, four and 26 Regio intercity and local traffic train 1336, of which 28 are Intercity, 198 and 1110 Regio. The passenger trains are only those of Căile Ferate Române. Private operators and they have put into service hundreds of trains daily, the total number of passenger trains is more than 2000 daily. The longest train route, as of 2005, is the one between Iași, in the north-east, and Timișoara, in the west, which takes 16 hours with an Interregio train to complete. For example, the journey between Suceava Burdujeni and Bucuresti is 447 km, and takes some 7 hours to complete at an average speed of 80 km/h. Freight services in Romania are operated mostly by CFR Marfă, the freight division of CFR, as well as by 28 other private companies who operate on lines leased from CFR Infrastructură. The CFR Marfă fleet is made up of 987 locomotives, most of which were built in Romania or the former Yugoslavia. The fact that rail freight remains maintains a strong market share in Romania, as well as a number of efficiency reforms, has led CFR Marfă to perform quite well financially in recent years, even though it remains loss-making. In 2003, the CFR Marfă's net loss was 8.8 million new lei (approximately US$3 million), reduced from 141.5 million new lei in 2002. Freight trains follow the same speed limits to those issued for passenger trains, although hazardous materials, explosive, nuclear, flammable, chemical or otherwise dangerous trains have a special regime. Most locomotives have a physical speed limit of 160 or 120 km/h, but freight trains are not usually running at speeds exceeding 100 km/h. A CFR conductor ("ceferist") helping a passenger at Gara de Nord, February 2008. CFR Călători (passenger services) and CFR Marfă (freight services) use a range of electric (known as LE), diesel electric (LDE), diesel hydraulic (LDH) and diesel mechanical (LDM/LDMM) locomotives. SFT (tourist railways division) uses steam locomotives (both narrow gauge and standard gauge) and diesel mechanical locomotives. Each of the four CFR divisions have their own locomotives, and these are generally not interchanged. For example, a CFR Marfǎ locomotive should not be used to pull a CFR Cǎlǎtori train. In practice however, this rule does not hold, and frequently the companies use other rolling stock through informal lease agreements. Moreover, private companies' rolling stock is used at times, usually because of emergencies (such as a locomotive breaking down and requiring a replacement to keep the line open, and an unused private locomotive being closer). Most of the electric locomotives employed by CFR were built by Electroputere Craiova (known as EA-type) and Rade Končar Zagreb (known as EC-type). All are built for standard gauge (1,435 mm (4 ft 8 1⁄2 in)) and run using a catenary wire at 50 Hz 25 kV AC. All trains have electric heating. CFR owns 1,066 electric locomotives, 933 of which were built by Electroputere(Class 40,41,42) and 133 built by Končar(Class 43,44,46). Older electric locomotives are painted in grey livery, while modernised (post-1999) rolling stock use red livery. CFR's diesel locomotives have been built by Electroputere Craiova (classes 60 to 68) and FAUR Bucharest (classes 69 to 95). 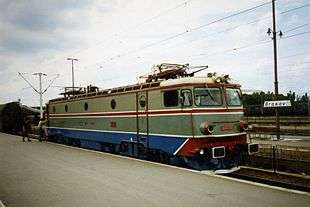 In recent years, diesel locomotives are mostly painted in a blue livery, while older ones have a grey livery. Classes 60 and 62 have as prime mover a twin-bank cylinder Sulzer 12LDA28 diesel engine rated at 2100 hp@750rpm, being derated from its nominal power by a smaller turbocharger and a lower max rpm. The difference between classes 60 and 62 is that the class 62 features traction motors certified and capable of pulling passenger coaches at 120 km/h instead of the 100 km/h allowed for class 60. CFR Călători uses diesel multiple units (DMUs) mainly for passenger services on shorter and little-used lines, even though recently, with the introduction of the Siemens Desiro DMU, they have been used for InterCity services on longer distances. Until June 2006, there were no electric multiple units (EMUs) in service. However, CFR has recently bought some second-hand Z-6100 EMU from SNCF, and their CFL version 250 with 2 cars and 260 with 3 cars, which are being modernised by Remarul 16 Februarie in Cluj and will be used for commuter trains. The first one is already in service, as class 58. CFR Calatori now plans to buy some 21 new EMUs, either from Siemens, Bombardier or Alstom. They should be delivered between 2007 and 2008. There are some rumours that some high-speed EMUs will also be bought (possibly of Pendolino type) for InterCity service, on the Bucharest-Brașov and Bucharest-Constanța line. Furthermore, a 6-car regional EMU built by Electroputere has been in prototype stage since 1990 after it experienced brake and engine problems during initial testing. Romania is linked by rail with all neighboring countries. ↑ "Lungimea căilor de transport, la 31 XII 2014". ziaruldeiasi.ro. 27 April 2015. ↑ "The UIC numbering scheme". Railfaneurope.net. Retrieved 10 July 2005. ↑ "Strategia de restructurare a domeniului feroviar" (PDF) (in Romanian). Ministerul Transporturilor şi Infrastructurii. 23 August 2010. Archived from the original (PDF) on 16 July 2011. ↑ "Săgeata Albastră revine pe "drumul de fier"" (in Romanian). Căile Ferate Române. Archived from the original on 15 December 2010. Retrieved 10 July 2005. ↑ "Noua Săgeată Albastră – De la 10 noiembrie şi pe ruta Timișoara-Reșița şi retur!" (in Romanian). Acasa.ro. Retrieved 10 July 2005. ↑ "De la 1 mai, biletele de tren se scumpesc cu 5,6%" (in Romanian). Wall-Street.ro. Archived from the original on 15 December 2010. Retrieved 10 July 2005. ↑ "Deschiderea Agenției de Voiaj Nr. 1" (in Romanian). Informatică Feroviară. Archived from the original on 5 March 2005. Retrieved 10 July 2005. ↑ "Fumătorii, jos din tren!" (in Romanian). Fumat.ro. Retrieved 4 October 2006. ↑ "București – Constanta" (in Romanian). Căile Ferate Române. Archived from the original on 15 December 2010. Retrieved 9 August 2006. ↑ "Parcul de locomotive CFR Marfă" (in Romanian). CFR Marfă. Archived from the original on 9 May 2007. Retrieved 30 October 2005. ↑ "Consolidated financial statements (2003)". CFR Marfă. Archived from the original on 15 December 2010. Retrieved 10 July 2005. "Istoria Căilor Ferate din România" (in Romanian). CFR Infrastructură. Retrieved 10 July 2005. "Dublări de linii" (in Romanian). CFR Infrastructură. Archived from the original on 27 April 2005. Retrieved 10 July 2005. "Electrificarea căilor ferate" (in Romanian). CFR Infrastructură. Retrieved 10 July 2005. "Înfiinţarea Cailor Ferate Romane" (in Romanian). CFR Infrastructură. Retrieved 10 July 2005. "Restructurarea și modernizarea infrastructurii" (in Romanian). CFR Infrastructură. Archived from the original on 27 April 2005. Retrieved 10 July 2005. "CFR a desemnat cele șapte firme pentru gestionarea unor secții de circulație neinteroperabilă" (in Romanian). Rompres. Retrieved 10 July 2005. Wikimedia Commons has media related to Rail transport in Romania.